ISJWTBAM(SICDGTAHP) is my only artwork…it may be purchased for $1,000,000. ISJWTBAM(SICDGTAHP) began in the year 2000. It is a continuous reconfiguring of all of my stuffs that I don’t need that I have not yet figured out how to ethically get rid of. 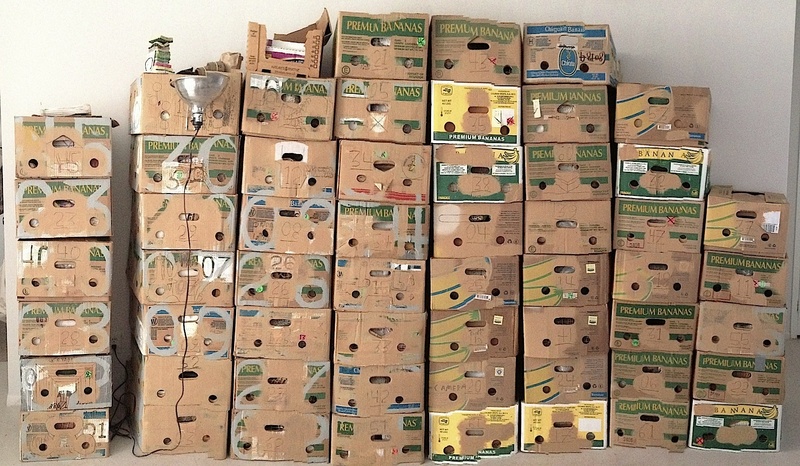 Currently there are 57 full banana boxes – each is an artwork made of artworks that all together are one artwork. Perhaps of some note (or not): I dispose of about one bag of trash per year. ISJWTBAM(SICDGTAHP) can fit into a space as small as 5x5x5 (ok maybe 7x7x7) feet or expand to fit any space – each box is 10x16x20 inches and averages 25 pounds. I will consider installing it, or part(s) of it, anywhere. I will expose as much of it as possible within the given time and space. I am open to living on-site during the process. I am open to collaborating. I am open to showing in conventional, alternative, and non-art spaces.